Just very curious as to why we are instructed to jack a trailer by the frame and not the axle. Here's why I'm curious. To my thinking, the trailer rides on the ground. Between the trailer and ground is some stuff. This holds the trailer up and the wheels down at the same time. Follow me as I trace the force(s) on one side. Trailer weight is on the frame, this load is sent to the upper spring shackles, through the springs to the spring pads on the axle, axle tube to hub to bearings to wheel to tire to ground, right? So, if all the load is carried by the spring pad (before sending it on down the line), why can't you jack an axle at the spring pad? My only thoughts, have to do with alignment. The axle tubes are bent, when the trailer alignment is done. Jacking by the axles would alter the bends. My concern about this was that "IF" we are supposed to jack by the frame then why didn't they beef the frame more in that area or design the plumbing so hose connections are out of the way. It doesn't seem to have enough meat for the weight in that one spot or enough importance to relate to the design process. Also, I couldn't see the same conditions existing if the axle is under the axle as well as over. Axles under the springs at least have the width of the spring against the axle but axles on top of the spring have all the weight concentrated in the small area the u-bolt meets the axle. If the axle is designed to such borderline specs as to fail jacking at the spring connection then how does it stand the potholes on almost any highway? I wonder if they use the frame location to make the jacked trailer more stable. Perhaps the wider area of the frame is perceived as more stable than the area under the axle. If it's two axle and jacking with one might be an issue with weight and jacking the axle in the middle may bend it. Jacking it one side by the center pivot should not be an issue. Pot hole issues are not stressing the center of the axle, the tube just holds it all together and really carries no weight so it does not have to be strong enough to hold the trailer weight. Jacking by the axles would alter the bends. I'm not suggesting jacking by the axle (as in somewhere along the tube). I was wondering why it would be a problem lifting a wheel off the ground by placing the jack under the point that is already carrying the load of the trailer. I can't see that being a problem. Also the spring bolts are strong enough to carry the weight with the axle on the top so that should not present a problem either. Maybe they are thinking damage to the link parts. If I have a flat it's raining and dark I'm going to get it off the ground in what ever means possible. I do believe the answer comes from, there is no one size fits all answer on this and if done wrong can create great havoc. The axle tubes on RV’er are so thin it is sort of pathetic and they do bend. In fact there are axle alignment shops that are setup to bend the axles to align the wheels. For sure, do not jack up ones camper in bound of the axle seat. 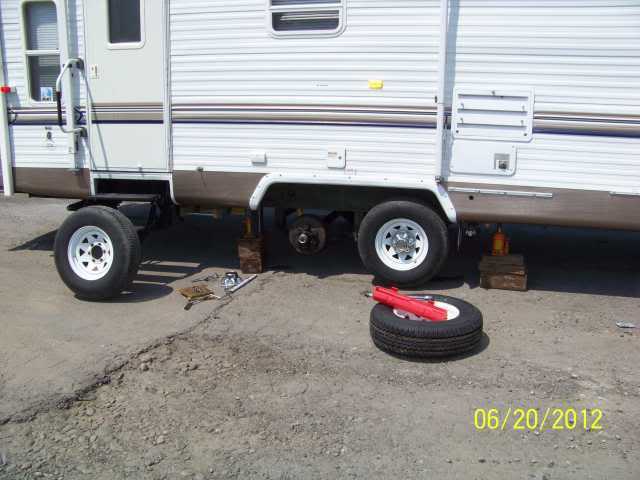 Pending the axle rating and the weight of the camper, you can change the camber in the axle. Camber is bent into the axle from day one. You should see an arch up in the center of the axle tube. As the axles load increase at the axle seats (springs area) the axles goes closer to flat. To give out a recommendation that fits about all situations, they recommend jacking up the camper off the ground by using the frame and just outside spring hanger. And one really does not want to jack up on the frame a great distance away from the spring hangers. The worst one can do is jack up the camper, or attempt to, at the very back of the camper. These RV trailer frames are so weak they will bend being several feet away from the axle area. If you do center the jack point under the axle seat, (notice I said under the axle seat. The axle seat has a reinforcement pad or attachment to the axle tube) take great caution once the axle reaches it’s normal ride height. You can look or measure the normal ride height from the wheel still on the ground. When you go a lot above the normal ride height then the spring is taking a lot more load then it normally does. If you actually jack high enough and the other wheel comes off the ground, you can reach the point where the equalizer has no more room to swing and you start flatten the spring if the spring does not have the capcity to lift the camper by 1 spring. That 1 spring is now taking the entire camper load on that side. Now this also happens sometimes when your towing and going over pot holes or up over high bumps. The one axle is taking all the load and the other axle starts to and in some cases leaves the ground, however it does not normally flattened the spring like a jack could. If done properly you can lift by the axle seat, but again watch out once you go past normal ride height. When you lift by the spring the arch of the spring changes as the spring loads up and this then changes the distance from the spring hanger pin to the center of the axle in relation to the jack planted firmly on the ground. That change in arch can push the jack to the front or rear pending which axle your lifting by. Depending on how loaded the axle was, that arch change may tip the jack on an angle if it was a bottle jack. A floor jack would roll if the surface allowed it to, if not it will slide on the jack pad. When you lift by the frame, this effect is greatly lessened. On a controlled level hard surface the risk is less at the jacking at the axle seat. Out on the side of the highway in not ideal conditions, jacking on the frame behind the spring hanger may present more options for safer lifting. This is how I myself do tire changes out on the road when it is not raining cats and dogs. One jack in front and one behind the spring hanger up on good cribbing with a large capacity jack for stability. Lucky me I had to do this, this year. Even while I am home on the concrete pad, I use a floor jack and lift on the frame. My camper also weighs 9,920# too. ... take great caution once the axle reaches its normal ride height. Ah, yes. I wouldn't want to jack it any higher than is necessry to R&R the flat. Thanks for all the posts. Consensus seems to be it's OK to jack at the axle seat if all the usual precautions are observed, only one wheel is lifted and the springs aren't compromised.